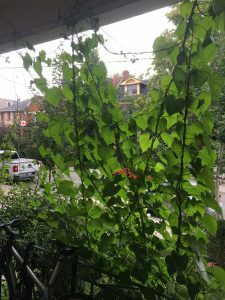 I grew my morning glories from seed and the vines are lovely and vigorous but there is NO sign of a flower. Is it possible that they will still come? I see other people’s flowering already in my Toronto neighbourhood. Fear not, your morning glories are not alone! (Mine haven’t bloomed yet either) They tend to start blooming very late in the season, so there is no need to be concerned if you don’t see flowers yet, especially if you started them from seed. Morning glories thrive on lots of sun… and neglect. That is, they do well in poor, well-drained soils, and they don’t need fertilizer. You should only provide supplemental water if the soil is nearly dry — watering deeply once a week is sufficient. If your morning glories are in a spot that receives full sun for most of the day, and you follow the rule of “no food, little water”, you should begin to see flowers later this month (i.e. August) or early September.